@snixxNKV!!! So glad to see you here again! Thank you and congratulations to you too (in advance)! You'll definitely graduate, just believe in yourself! Aja! Oh about the 2 of them, I saw some things about KV around last year but the problem is it has analysis but it is in another language I can't fully understand what it was saying and when it comes to analysis like that we need to have a clear explanation as much as possible but again because of the language barrier I can't fully understand what it was saying. Really? You can always message me personally so that we can talk about that "info" personally and analyze things before posting it here. @twinkies20 Actually Khun's red hoodies also from Vetements brand LOL. It's also Vic's fav clothes brand. 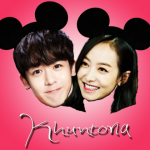 Vic has black one and Khun has the red version one. What a soulmate these two LOL. Not to mention Wooyoung also share same SUPREME fur jacket just like Vic's LOL. Left is Khun Weibo post, right one is a fan who saw vic and captured her. look at the time when the fan posted. The fan said he/she saw Vic in Nike Store at Sanlitun, Vic looked slim. Vic and Cherreen ( Khun's little sister) have same design phone cases. @little bunny I knew that hoodie is quite familiar! Thank you again for posting about it. Now it makes more sense It's not just the color who is similar but the brand as well Here is a closer look as edited by yours truly Good night everyone! HELLO @pucca_chan and welcome back! Hi Everybody ! I miss this! 02/23/2018 Nichkhun is chosen as a new presenter for Tao Kae Noi. The press conference will be held on 27th Feb at 13:00 at Quartier Avenue, G Floor at The Emquartier.